Updated Sun 15 Feb 2015 • tags myanmar, scriptnotes. This page provides basic information about the Myanmar script and its use for the Burmese language. The phonetic information and examples are for Burmese. It is not authoritative, peer-reviewed information – these are just notes I have gathered or copied from various places as I learned. For character-specific details follow the links to the Myanmar character notes. Clicking on red text examples, or highlighting part of the sample text shows a list of characters, with links to more details. Click on the vertical blue bar (bottom right) to change font settings for the sample text. Colours and annotations on panels listing characters are relevant to their use for the Burmese language. More links for the Myanmar script. The Myanmar script was adapted from the Mon script, a descendent of Brahmi, and is found in stone inscriptions dating from the 12th century. It is used for writing the Burmese and Mon languages, both spoken in Myanmar (previously Burma). The two languages differ in how some phonemic values are assigned to letters. The script is also used, with character extensions, to write some of the Karen languages spoken in Myanmar and Thailand. The Burmese alphabet (Burmese: မြန်မာအက္ခရာ; pronounced [mjəmà ʔɛʔkʰəjà]) is an abugida used for writing Burmese. It is ultimately a Brahmic script adapted from either the Kadamba or Pallava alphabet of South India, and more immediately an adaptation of Old Mon or Pyu script. The Burmese alphabet is also used for the liturgical languages of Pali and Sanskrit. The script is an abugida, ie. consonants carry an inherent vowel sound that is overridden, where needed, using vowel signs. See the table to the right for a brief overview of features, taken from the Script Comparison Table. Spaces are used to separate phrases, rather than words. The pronunciation of vowels depends on their context, ie. whether in open syllables, checked syllables, or closed syllables ending with a nasal. Myanmar has both a visible diacritic to kill the inherent vowel (asat) and an invisible virama to produce stacking. The latter doesn't always cancel the intervening vowel. There is a set of dedicated medial consonants, encoded as combining marks. There is only one dedicated final consonant (the anusvara). Other final consonants are marked by the asat, however, so parsing text for syllabic breaks is largely straightforward. Follow these links for information about characters used by languages associated with this script. The numbers in parentheses are for non-ASCII characters. For character-specific details see Myanmar character notes. The Burmese language is tonal and syllable-based. Words are composed of syllables. These start with an consonant or initial vowel. An initial consonant may be followed by a medial consonant, which adds the sound j or w. After the vowel, a syllable may end with a nasalisation of the vowel or an unreleased glottal stop, though these final sounds can be represented by various different consonant symbols. At the end of a syllable a final consonant usually has an 'asat' sign above it, to show that there is no inherent vowel. In multisyllabic words derived from an Indian language such as Pali, where two consonants occur internally with no intervening vowel, the consonants tend to be stacked vertically, and the asat sign is not used. Characters with an asterisk are potentially followed by an asat sign. Unfortunately, normalization may result in a different order. In particular, ် [U+103A MYANMAR SIGN ASAT​] occurs after ့ [U+1037 MYANMAR SIGN DOT BELOW​] in normalized text. Applications such as fonts should still handle this alternative order, since the sequences are canonically equivalent. The following schematic shows sequences that typically make up a syllable in Burmese. Start with the C (consonant) on the left, or IV (initial vowel) and travel from left to right only. You can stop at any point. The plus sign in the box represents the virama – this should be followed immediately by another syllable, as should the kinzi. Myanmar text is written horizontally, left to right. Consonants carry an inherent vowel usually transcribed and pronounced in Burmese as a in open syllables, but very often reduced phonetically to ə. So က is pronounced ka. In closed syllables, the inherent vowel is pronounced as one of ɪ, e, a, or ɛ, depending on the final consonant that follows, eg. နှစ် nh̆ṡˣ n̥ɪʔ year. To produce a different vowel than the inherent one, Myanmar attaches vowel signs to the preceding consonant, eg. ကိ ki. Burmese vowel signs are all combining characters. Several are spacing marks, meaning that they consume horizontal space when added to a base consonant. In Burmese, up to 3 vowel-signs can be combined to create additional sounds, but each combining character represents only a single glyph. The first two and last two items in the list are actually just shaping variants of the same vowel. See shapechanges. The pronunciation of the vowel-sign often depends on whether it appears in an open or closed syllable, eg. compare ဆိုး ṡʰiu² sʰó bad (open) and ဆိုင် ṡʰiuŋˣ sʰàɪɴ store (closed). For more details about Burmese pronunciation, see burmese_phonetics. The 'primary' vowels have 'short' and 'long' written forms that hark back to the earlier Indic script origins, but the distinction is used nowadays for indicating different tones only. For example, compare the tones in the open syllables at the beginning of မိနစ် minṡˣ mḭnɪʔ minute and မီ mï mì before. Show other, non-Burmese, vowel-signs in the main Myanmar block. For example, ပေါင် peäŋˣ pàʊɴ thigh. Where there is no ambiguity, however, the normal shape is used, eg. ပြောင်းဖူး pj̆eaŋˣ²pʰu̇² pjáʊɴbú corn. As mentioned later, there are also special long forms of ု [U+102F MYANMAR VOWEL SIGN U​] and ူ [U+1030 MYANMAR VOWEL SIGN UU​] when there is not enough room for them below a cluster. These forms need to be produced by the font, since there are no special characters for them. A consonant cluster is treated as a unit when it comes to vowel-signs, for example အငွေ ʔŋw̆e (a.ngwe), where the E is displayed to the left of the NGA although the character appears after the WA in memory. The following list shows where vowel-signs are positioned (by default) around a base consonant to produce vowels, and how many instances of that pattern there are. Numbers after the + sign represent combinations of vowel-signs. Some vowel signs that would normally appear below a consonant are normally displayed to the right if something else intrudes on that space, such as a stacked consonant eg. စက္ကူ ṡk͓ku̇ sɛʔkù paper, or a medial consonant eg. အဖြူ ʔpʰj̆u̇ ʔəpʰjù white, or a consonant with a 'descender' eg. အညို ʔɲiu ʔəɲò brown. Myanmar represents standalone vowels using အ [U+1021 MYANMAR LETTER A] as a base for vowel-signs, eg. အိတ် ʔitˣ ʔeɪʔ bag. Note that this is classed as a consonant rather than a vowel by the Burmese, and carries the inherent vowel when used alone, eg. အတန်း ʔtnˣ² ʔa̰táɴ class. Myanmar also has a set of independent vowel letters used to represent standalone vowels, but only in certain words – typically Indian loan words, eg. ဧရာဝတီ ẹṙawtï ʔèjàwa̰tì Irawaddy river, ဩဂုတ် ɔ̣gutˣ ʔɔ́goʊʔ August, and ဤ ị̈ ʔì this. There are normally different forms for specific tones, and normally only one or two vowel+tone combinations have these forms. There are four tones in Burmese, creaky, low, high and stopped. The tone of a syllable can be indicated by the vowel used, or by a combination of vowel and one of the following combining marks. 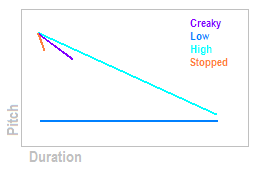 The stopped tone only, but always, occurs where a syllable ends in a stop consonant. Syllables that end with a vowel sound and syllables that end with the nasal sound ɴ can have one or more of the other three tones. The phonemic transcriptions here use the following conventions for marking tones, using a as the base for the examples. For more details about tones in Burmese, see burmese_phonetics. Show other, non-Burmese tone marks in the main Myanmar block. This section provides more detailed information about the pronunciation of rimes in Burmese. A vowel plus tone combination is called a rhyme. The following table shows the normal combinations of vowel, final consonant and tone mark characters that are seen in Burmese, and their pronunciations. Read down the left column to find the symbol used for the vowel sound, and across the top row to find syllable final consonants. The table doesn't take vowel reduction into account. The following table summarises the above in a way that allows you to see how the various tones are applied to open syllables using the native Myanmar characters. Where long vs. short forms exist, for the purposes of clarity in the table, the long form is taken here to be the standard form and the short form a variant. Vowels in 'closed' syllables end in a glottal stop or nasalisation. Historically, however, they ended in one of four nasals or four stops, and this is still reflected in the orthography. The vowel quality has also evolved in these syllables, typically producing diphthongs. To indicate that the consonant is syllable-final, an asat is placed over it. The sound values of vowel signs used in open and closed syllables differs systematically as follows. i becomes eɪ, eg. အိန် ʔèɪɴ; အိတ် ʔeɪʔ. u becomes oʊ, eg.အုန် ʔòʊɴ; အုတ် ʔoʊʔ. ɔ becomes aʊ, eg. အောင် ʔàʊɴ; အောက် ʔaʊʔ. o becomes aɪ, eg. အိုင် ʔàɪɴ; အိုက် ʔaɪʔ. The inherent a is a lot more complicated, becoming one of ɪ, e, a, or ɛ. The list of most common sounds are show in the large table above, and in the smaller tables below. There are other combinations of vowel and final consonant found in Burmese words of Indian origin, which often stick to the original Indian spelling, however, they tend to follow Burmese pronunciation, eg. ဓာတ် daʔ, ဗိုလ် bò, ဥယ္ယာဉ် ʔṵjaɴ. The following table lists the main sounds in Burmese where the syllable ends in a nasal. Note how အည် doesn't end in a nasalisation. There is another consonant, ဉ [U+1009 MYANMAR LETTER NYA], which has come to be used to produce nasalisation. These syllables are by default low in tone, but creaky and high tones can be indicated using ့ [U+1037 MYANMAR SIGN DOT BELOW​] and း [U+1038 MYANMAR SIGN VISARGA​] in a very regular way. Note that the tone mark appears at the end of the syllable, not immediately after the vowel, eg. အုန့် and ကောင်း. The following table lists the main sounds in Burmese where the syllable ends in a stop. These syllables are all unmarked 4th (stopped) tone. A process called vocalic weakening affects the first syllables of certain words (mostly nouns and adverbs), eg. ထမင် is pronounced tʰəmɪ̀ɴ, not tʰa̰mɪ̀ɴ; ဘုရား is pronounced pʰəjá, not pʰṵjá. Native Burmese words use a subset of the consonants that make up the traditional articulatory arrangement of indic scripts. Additional symbols are available for use in loan words, especially Indian loan words. These include the retroflex and voiced aspirated consonants. Other characters in the Myanmar Unicode block are used for variations for minority scripts based on the Myanmar script. The latter are not dealt with here. Show the other consonants in the main Myanmar block. Some Burmese conventions exist for representing foreign sounds. f is ဖ (usually pʰ), v is ဗ (usually b) or ဗွ (usually bw), eg. တီဗွီ tïbw̆ï tìbwì T.V. A foriegn syllable final sound can be rendered by placing a second killed consonant after the syllable, sometimes in parentheses, eg. ဘတ်(စ်) ḃtˣ(ṡˣ) bas bus. Unvoiced syllable initial consonants are typically pronounced with voicing when they appear in non-initial syllables of a word or in particle suffixes, unless they follow a syllable with stopped tone or follow the အ [U+1021 MYANMAR LETTER A] prefix. Aspirated consonants lose their aspiration at the same time. For example, သတင်းစာ farmer is pronounced θədɪ́ɴzà not θətɪ́ɴsà. However, because of the rule about the stopped tone (ie. a syllable ending in a plosive consonant), တစ်ဆယ် ten is pronounced təʔsʰɛ̀ not təʔzɛ̀. Syllable-final consonants carry a visible mark called a.sat (အသတ် ʔa̰θaʔ) to indicate that the inherent vowel is killed, eg. see the small 'c' like mark over the last character in ဝင် wŋˣ wɪ̀ɴ enter. ် [U+103A MYANMAR SIGN ASAT​] is a character introduced in Unicode version 5.1 for this purpose. It is effectively a visible virama. In native Burmese, 9 characters (5 nasals, င ဉ ည န မ NGA, NYA, NNYA, NA and MA, and 4 stops, က စ တ ပ KA, CA, TA, PA) appear in syllable final position. Final position nasals are pronounced as a nasalization of the previous vowel, eg. ရင် ṙŋˣ jɪ̀ɴ if, and all stops are pronounced ʔ, eg. မတ် mtˣ maʔ March. Some syllables ending in nasal consonants use the anusvara rather than the ordinary consonant sign, eg. သိမ်း θimˣ² θéɪɴ save but သုံး θun̽² θóʊɴ use. When used as non-initial consonants in an onset cluster, ယ [U+101A MYANMAR LETTER YA], ဝ [U+101D MYANMAR LETTER WA], ရ [U+101B MYANMAR LETTER RA], and ဟ [U+101F MYANMAR LETTER HA] have special medial forms. 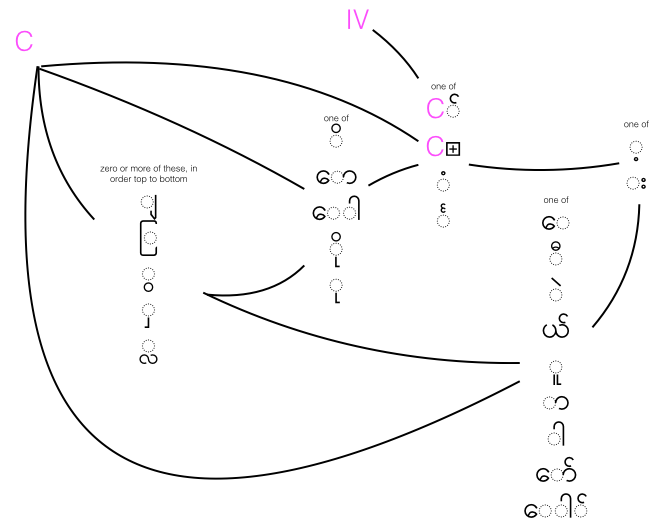 Unicode has dedicated combining characters for each of these, eg. ချက် tɕʰɛʔ cook, ကြက် tɕɛʔ chicken, နွား nwá cow, and မှာ m̥à in, at. It is possible to find two medials in an onset cluster, eg. လျှ lʰjá or ʃá and မြွေ mwè snake. The combination of velar stop and medial RA or YA are pronounced as tɕ, eg. ကြက် tɕɛʔ chicken, ကျပ် tɕaʔ to be tight. Show other non-Burmese medials in the main Myanmar block. The medial HA is used to create aspirated versions of consonants, and also to create the sound ʃ. The latter is represented by either ရှ or လျှ (see the example above), depending on the word, eg. ရှိတယ် ṙh̆ityˣ ʃḭdɛ̀ to have. The old spelling of many words uses a fifth medial consonant, la swe, eg. ခ္လိုဝ်း kʰ͓liuwˣ² wash, which is produced using just a subjoined လ [U+101C MYANMAR LETTER LA]. The second consonant appears below the first, eg. မန္တလေး mn͓tle² màɴda̰lé Mandalay, and ဗုဒ္ဓ bud͓d̊ boʊʔda̰ Buddha. In some cases the lower character is abbreviated or reoriented, eg. က္ဌ to represent က်ဌ. This effect is achieved by using the character U+1039 MYANMAR SIGN VIRAMA between the consonants forming the cluster. The virama is never visible. Where the same consonant appears at the end of a syllable and the beginning of a new syllable in the same word they are commonly represented in the usual cluster form, eg. ပိန္နဲသီး pin͓nɛθï² pèɪɴnɛ́ dʰí jackfruit. When the first consonant in a consonant cluster is a non-word-final င [U+1004 MYANMAR LETTER NGA] it rises over the following letter and keeps its virama, rather than pushing the following consonant below it, eg. အင်္ဂလန် ʔŋˣ͓glnˣ ʔɪ̀ɴga̰làɴ England. This is called 'kinzi' (ကင်းစီး kɪ́ɴzí). To achieve this, use the sequence င + ် + ္ [U+1004 MYANMAR LETTER NGA + U+103A MYANMAR SIGN ASAT + U+1039 MYANMAR SIGN VIRAMA​] , then continue with the next letter. In Unicode 5.0, ် [U+103A MYANMAR SIGN ASAT​] did not exist, and U+1039 MYANMAR SIGN VIRAMA had to be used for both visible and non-visible viramas. This approach was problematic in that, since there are no spaces between words, it is not easy to automatically ascertain whether a virama should appear above a consonant or cause the stacking effect. For example, should my sequence of characters appear like this, အမ်မီတာ, or like this အမ္မီတာ? To get around this in Unicode 5.0 you needed to use a U+200C ZERO WIDTH NON-JOINER (ZWNJ) after the virama if you wanted it to remain visible (ie. the first example above would have been transcribed as ʔmˣmïta and the second as ʔm͓mïta). The non-joiner prevents stacking. In practice, this meant that there were very many ZWNJ characters in Burmese text, since there are many syllable-final consonants needing ASAT, and typing in the Myanmar script was therefore much more time-consuming than it needed to be. Unicode 5.1 also introduced dedicated medial consonants. This makes it easier to type Myanmar text, but also allows for easy distinction of subjoined variants of these consonants rather than the usual medial forms. One or two other characters were introduced, such as the TALL AA. Apart from those listed earlier for vowel-signs, tones, and medial consonants, Burmese uses three other important combining marks. ံ [U+1036 MYANMAR SIGN ANUSVARA] and ် [U+103A MYANMAR SIGN ASAT] are used for syllable-final consonants (see syllfinal). ္ [U+1039 MYANMAR SIGN VIRAMA] is used to produce stacking behaviour for consonant clusters (see stacking). The Unicode Myanmar block includes the following punctuation and symbols. The Unicode Myanmar block has two characters with the general category symbol. Neither are used in Burmese. The Unicode Myanmar block includes two sets of digits. The first is used for Myanmar, but also tends to be used for other languages, including those with their own scripts, such as Tai Nüa. There is also a set of Shan digits. The following is a selection of examples of situations where OpenType or similar font features are needed to produce Burmese text as expected. It is not an exhaustive list. Glyphs for subscripted consonants tend to be smaller than their full forms, eg. သဒ္ဒါ θd͓dä θəda grammar, and may be rotated, eg. က္ဌ . The shape of ြ [U+103C MYANMAR CONSONANT SIGN MEDIAL RA​] changes according to what it surrounds, eg. compare the two different widths in the word ကြက်သွန်ဖြူ kj̆kˣθw̆nˣpʰj̆u̇ tɕɛʔθʊ̀ɴbjù garlic and shortening at the top right of ဝန်ကြီး wnˣkj̆ï² wʊ̀ɴtɕí minister. The joining behaviour of ျ [U+103B MYANMAR CONSONANT SIGN MEDIAL YA​] also differs, eg. ချက် kʰy̆kˣ tɕʰɛʔ cook vs ကျွန်မတို့ ky̆w̆nˣmtiu¹ tɕəma̰do̰ (female) we. The asat varies its position and shape according to context, eg. လမ်း lmˣ² láɴ road, but ဒေါ်လေး deäˣle² dɔ̀lé aunt. The shape of NA changes when something appears below it, eg.နို့နဲ့ niu¹nɛ¹ no̰nɛ̰ with milk. Similarly, the bottom of NYA ဉ also changes in the following context, ပဉ္စမ pɲ͓̇ṡm pɪ̀ɴza̰ma̰ fifth. The placement of ့ [U+1037 MYANMAR SIGN DOT BELOW​], used as a tone mark, varies slightly according to context, eg. ပြီးခဲ့တဲ့ pj̆ï²kʰɛ¹tɛ¹ pígɛ̰dɛ̰ last and တချို့ tkʰy̆iu¹ tətɕʰo̰ some, as does that of ှ [U+103E MYANMAR CONSONANT SIGN MEDIAL HA​], eg. it is smaller than usual in ကောက်ညှင်း keakˣɲh̆ŋˣ² kaʊʔɲ̥ɪ́ɴ sticky rice, and the shape and position are very different in ရွှေပဲသီး ṙw̆h̆epɛθï² ʃwebɛ̀ snow peas. Other examples noted above include the change of shape and position of ု [U+102F MYANMAR VOWEL SIGN U​] and ူ [U+1030 MYANMAR VOWEL SIGN UU​] when other items appear below the base consonant, and the production of the kinzi. Myanmar script doesn't separate words in a phrase. There is, however, a concept of words. Native Burmese words are typically monosyllabic, but there are also mutlisyllabic words, and these should not be broken during line wrapping. Spaces are used to separate phrases, rather than words. Phrase length is variable. Examples can be seen in the extract from the Declaration of Human Rights at the top of the page. Punctuation is commonly limited to ၊ [U+104A MYANMAR SIGN LITTLE SECTION] and ။ [U+104B MYANMAR SIGN SECTION], with significance close to comma and full stop, respectively. If it is necessary to break text within a phrase, breaks can occur at syllable boundaries, but not within a word. The difficulty is that there is no visual information about which sequences of syllables consitute a word. The best way of detecting line-break opportunities is to use a dictionary to search for polysyllabic words, and then break at syllable boundaries outside the word. This approach may run into problems when uncommon words or new words are used, especially those borrowed foreign terms. An alternative is to indicate break points by inserting U+200B ZERO WIDTH SPACE between words when the content is developed, although this can lead to a lot of extra work. [ u ] The Unicode Standard v7.0, Myanmar. Last changed 2019-04-16 9:49 GMT. • Make a comment. • Licence CC-By © r12a.